Stocks are limping into earnings season, after a rough early October rout, and analysts say earnings could be what ultimately could help reverse losses. 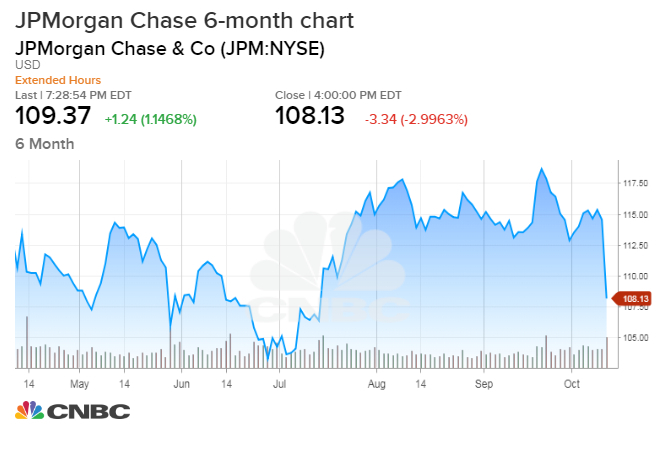 J.P. Morgan Chase is the first big blue chip to report, and is looked at as a bellwether for banks and the economy, so its report and outlook could be critical for how stocks trade on Friday. Futures were higher Thursday night, and if JPMorgan earnings help sustain the rally it could be important for the overall market. If stocks are going to make a comeback Friday, it could have a lot to do with J.P. Morgan Chase. The bank, along with Wells Fargo and Citigroup, is set to release earnings. But J.P. Morgan, the crème of the banking sector is the one to watch, particularly during its conference call in the hour before the opening bell. "I think the market is going to be laser focused on J.P. Morgan," as it's the first big blue chip to report, said David Lefkowitz, senior Americas equity strategist at UBS Global Wealth Management's Chief Investment Office. J.P. Morgan is set to report earnings at around 7:00 a.m. ET Friday morning and traders will be listening to CEO Jamie Dimon's comments about the economic and banking outlook on the bank's earnings conference call at 8:30 a.m. ET. The bank is expected to report earnings of $2.25 a share for the previous quarter, up from $1.65 a year ago, according to Thomson Reuters. Revenues are expected at $27.5 billion versus $25.2 billion the same period a year ago. "It's hard to predict when the precise bottom is in with these type of events, but I think the risk reward is looking more attractive and our six month target on the S&P is 2,950. I think earnings season is going to be very crucial," said Lefkowitz. "If our perspective is right, it's about growth and the more we hear form companies about the growth outlook, and if it's in tact, that would be a possible catalyst to move things higher." In this week's sell-off, the market has broken through many key technical levels, which have been widely watched across the market —not just by chart analysts. 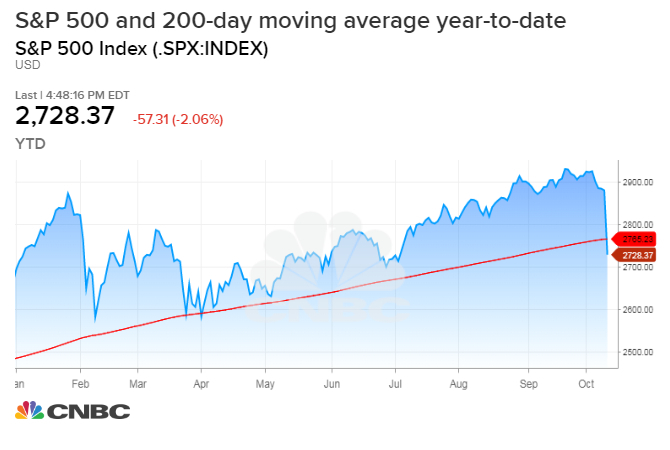 The S&P 500, for instance, broke through a key momentum level, the 200-day moving average, Thursday. That level was 2,765. "It's the 200-day test. Today we were driven down to the 200-day moving average. Sometimes, it's very important to hold it but it's really important to see how it acts for two or three days," said Scott Redler, partner with T3Live.com. Redler, who watches short term technicals, said if stocks can bounce and hold, it would be a good sign that the selling could be nearing an end. "Right now, we just had the normal corrective move that we've had multiple times over the last few years where the S&P comes down five to six percent off its highs. Everyone gets bearish and starts talking about 10, 15, 20 percent corrections. The question is do we get back above [the 200 day] and rally in the next two or three sessions?" he said. "If not, the bears will get some confidence and could turn it into a 10 percent correction or more." An important next move could be determined by JP Morgan. "Do the banks act better after JP Morgan? And does tech start to find its footing? Traders are going to try to figure out whether this is the spot to dip your toe in," he said. JP Morgan stock has lost 6.2 percent this week so far. "If it reacts well, that could help an oversold bounce. Right now, it's not pricing in perfection or a beat. The stock got hit pretty hard. All it has to do is be in line, and [CEO Jamie Dimon] has to sound somewhat optimistic, and I do think there will be a relief rally."